Visiting Perú and not flying over the Nazca Lines seems illogical to some. I was in Nazca and didn’t do it. It’s like visiting Ecuador, and not taking the excursion out to the Galapagos, which I didn’t do either, for similar reasons. First of all, I don’t typically travel for the sake of seeing tourist sites. I travel for the sake of self betterment, for the hope of personal improvement, and who knows? Maybe even self enlightenment. Let’s shoot for the stars. Learning more about the fascinating history of the geoglyphs and the pre Incan people who magically created them can be a way to self improve. 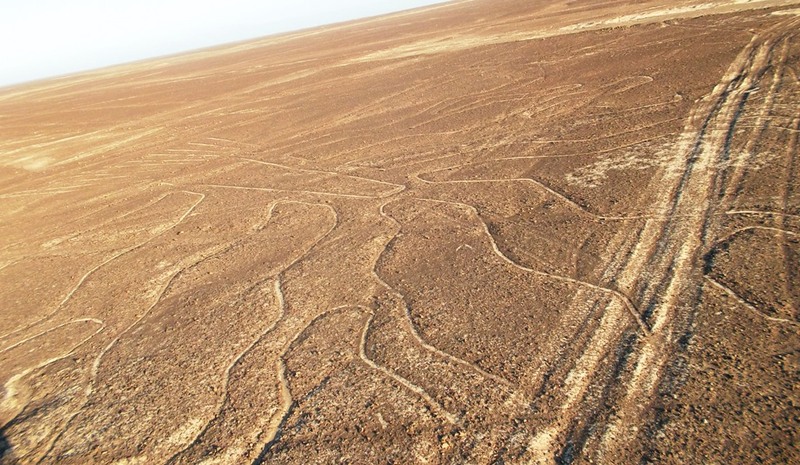 Seeing the geoglyphs from aloft will certainly cause you to ponder and wonder. But I travel on a limited budget. A 30 minute flight over the lines costs about $100. My guess is that if you haggle hard, you can get them down to around $80. But I didn’t want to drop $80 on a flight that wasn’t taking me to a destination. When I fly, it’s to get somewhere. I can’t justify paying for a siteseeing flight. It’s superfluous to my budget, which isn’t a real budget, but more of an idea: Spend as little as possible but splurge a little when something seems like a stellar value. There will always be endless ways to spend money everywhere. My gut feeling told me that the Nazca Lines weren’t a priority. Being a traveler, I see new things daily. They’re often free or of low cost. I don’t have to do everything that’s available. Sometimes I can see things when I’m already on a flight getting somewhere. The view is of the River Thames. I changed planes in London’s Heathrow while enroute to India last June. Hoping to see more than just clouds when I fly, I always ask for a window seat. This is a view I had of the Gulf of Mexico along Florida’s south coast while flying towards the Caribbean enroute to Colombia this past January. 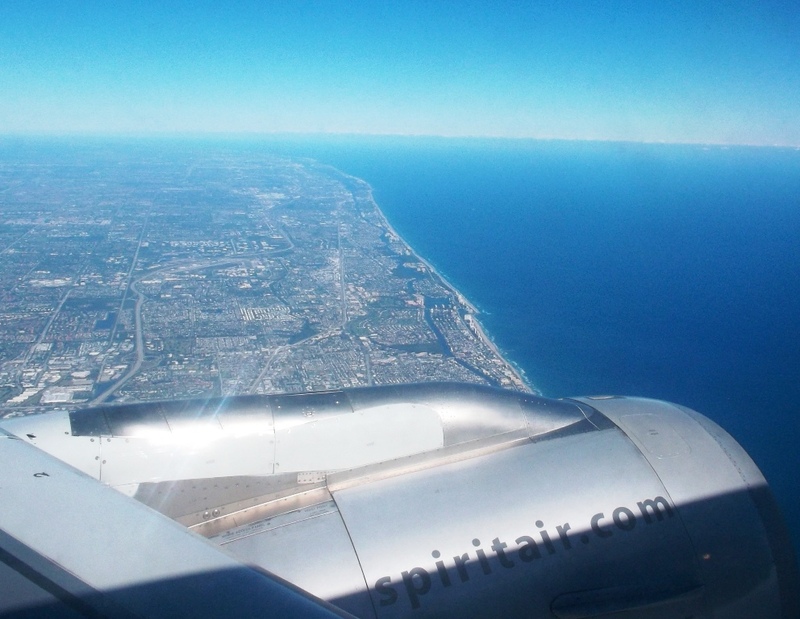 TIP: Remember to try to get a window seat that’s not on the wing. The wing and engine here bought down the value of my passage. Airplanes are considered to be very harmful to the environment. This is a good reason to fly only when it’s a necessity. The Nazca Lines sightseeing operation seems like a tourist trap. There are planes constantly dropping off and picking up foreign tourists. It’s good for the locals who make their living off of it, but it’s not good for my long term travel economics or budget psychology. Nazca is a quaint, relatively friendly little city. I stayed for three nights and enjoyed the Plaza de Armas, the mercado, the archaeological museum, and two of the Nazca lines that I could observe from a tower climb. The climb is not for someone with a fear of heights. This is the peaceful Plaza de Armas, even though armas means arms as in weapons. All Peruvian cities have a Plaza de Armas to recognize the land’s independence. 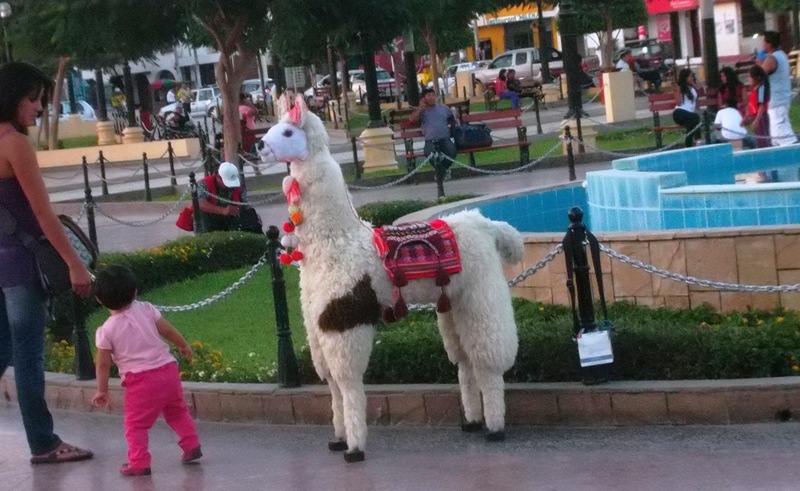 I’m not sure if the animal is an alpaca or llama. To me, this type of animal is one of the cutest on earth. From this mirador, or lookout point, I could see the view of the tree geoglyph that you see at the top of the page. 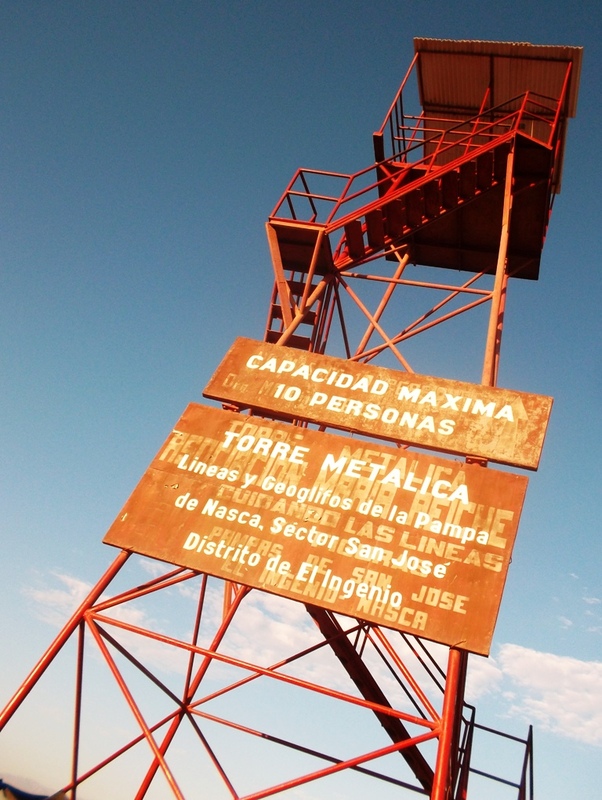 You need to take a bus or taxi to this tower, which is 20 km north of Nazca. I took a bus which cost 2 soles, or $.76 each way. The cost of climbing up the mirador is 5 soles, or $1.90. Skulls from the Museo Arqueologico Antonini. The museum has an interesting adobe collection and a nice garden outside. The entrance fee is 15 soles or $5.73. Have you flown over the Nazca Lines? Would you like to? Feel free to leave a comment?